Salesforce is a top CRM product that has helped organizations increase lead conversions by 32%, sales revenue by 27%, improve faster deployment by 56% and customer satisfaction by 34%. “Our clients want experienced and certified salesforce.com consultants, developers and administrators. Companies are getting finance approved for implementing salesforce.com throughout their organisations, so specialist consulting and implementation services in this space are on the increase.”- said Lee Durrant, MD of Resource on Demand. Salesforce CRM has gained traction in several business organizations in the technology industry. The demand for Salesforce professionals spans across different geographies and industries with scores of job opportunities for Salesforce Developers, Salesforce Administrators, and Salesforce Business Analysts. Increased number of businesses are signing contracts every day for using Salesforce which is why there is a huge demand for Salesforce skills, expertise and knowledge. Even smaller companies are investing in Salesforce and larger companies are upgrading their Salesforce systems to fulfil their requirements for customized applications. 2) Historical strength of Salesforce is in its CRM capabilities with the Sales Cloud -making it a major CRM player in the digital marketing space with a series of big name acquisitions. Most of the career counsellors at DeZyre get asked this question a lot –“We are looking to make a career change but the concern is that we do not have any background or experience or any basic knowledge in Salesforce.” For people who are reading this blog and in a dilemma about switching their careers into Salesforce, one thing that needs to be remembered is that Salesforce is just a CRM tool and any tool can be learnt through a comprehensive formal training course without the need of any special background. “The demand for CRM developers, which has been “active and consistent” for several years, has spiked in the last few months. It’s not unusual to speak to CRM candidates early in the morning and by 1 p.m. they have one job offer and by 3 p.m. they have multiple offers. They typically land a job the same day.”- said Vimal Shyamji, General Manager for Technology Contracting at Recruiting Firm Winter, Wyman. Salesforce developer is an individual who can develop cloud based applications through the force.com platform with an in-depth understanding of Salesforce and its limitations. A Salesforce developer must possess strong knowledge of VisualForce and Salesforce development with experience in coding using APEX. A good salesforce developer must possess knowledge of Java and various other programming languages. The average salary for a Salesforce Developer on contractual basis is approximately $120+ per hour and close to $130K annually (full-time). 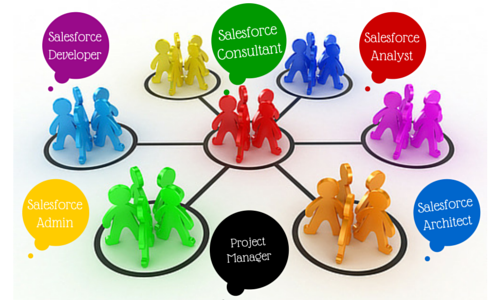 There is a short supply of Salesforce developers when compared to the increasing demand. 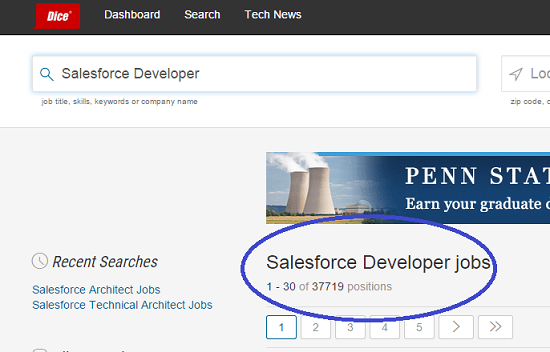 As of 22 ndJuly, 2015, the search term for Salesforce Developer on the popular job portal Dice.com showed 37719 job listings. The salaries for Salesforce Developers range from $70,000 to $150,000. Salesforce administrators work with people at all levels in the organization, from CEO to the end users, so must command exceptional communication skills. Thus, professionals who can communicate effectively with individuals at different levels will excel as administrators. The job role of a salesforce administrator is “Customer Facing”. Thus, a person who has the patience and ability to listen and understand customer problems, need and issues, will do great. The beauty of Salesforce as a CRM tool is that there is no specific way of doing anything in Salesforce. 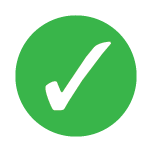 For a single set of requirements, there could several solutions. It is the responsibility of the Salesforce administrator to think out of the box and ensure that all the business requirements are being fulfilled by capturing various possibilities. 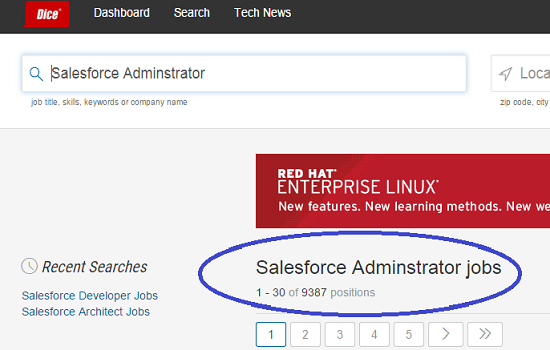 According to Indeed.com, the average salary for a Salesforce Administrator in US is $82,000 as of July 22 nd, 2015. The average salaries for Salesforce Administrators in San Francisco, CA are 35% higher when compared to other Salesforce administrator job postings in US. A Business Insider article titled “The Best Skills to Have on a Tech Resume” highlighted “Salesforce Architect” as the most valued skill amongst the job titles with highest average salary ranging from $180,000 to $200,000. According to Indeed, the average salary for a Salesforce Architect in US is $112,000 is as of July 22 nd, 2015. The job role of a Salesforce Architect is at the top of Salesforce CRM as there were only 100 certified Salesforce Architects across the world as of 2014.A salesforce technical architect job role requires complete expertise on the web services, the entire Salesforce platform, various web development languages, in and out of various business processes governing the organization. To get hired as a Salesforce Technical architect, an individual must be exceptionally skilled in Salesforce. 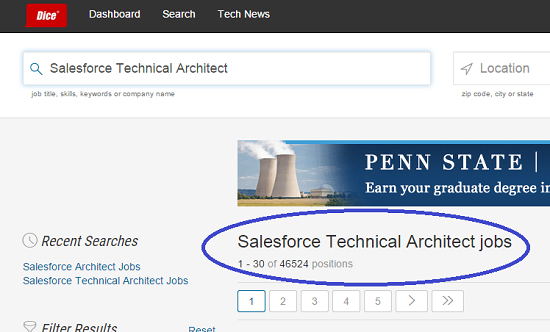 As of 22 nd July, 2015, the search term for Salesforce Technical Architect on the popular job portal Dice.com showed 46524 job listings. The salaries for Salesforce Architects range from $80,000 to $200,000. With increasing customer base for the Salesforce CRM, the demand for Salesforce consultants is on the rise as companies need them for typical implementation. Salesforce consultants are the prime resources in an organization as they add value to business by generating revenue and bring value to the clients. A salesforce consultant adds value to the organization and must be business savvy with people, have a good grasp on the technical features and functionalities of the Salesforce platform. Salesforce consultants must be competent on the salesforce CRM platform so that they can develop appropriate solutions and analyse how changes impact a business for better or worse. 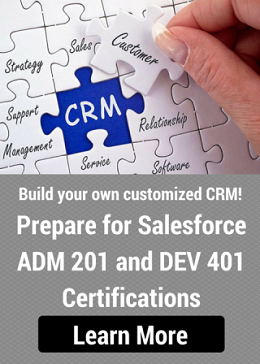 It is not necessary for the consultant to know every minute feature of the CRM platform but he or she needs to understand what functionalities are offered by Salesforce, how data flows into the CRM system and how it is distributed. A good consultant is one who appreciates the platform and knows how to leverage the different tools offered by Salesforce to solve critical business problems. According to Indeed, the average salary for a Salesforce Consultant in US is $91,000. As of 22 nd July, 2015, the search term for Salesforce Consultant on the popular job portal Dice.com showed 21249 job listings. The salaries for Salesforce Consultants range from $50,000 to $140,000. With increase in Salesforce implementations by organization across different industries, the demand for Salesforce professionals who can run the projects is increasing exponentially. Salesforce project manager is an individual with an in-depth understanding of cloud computing, application of cloud computing within a business and expertise in using the Salesforce platform. The role of a Salesforce project manager is to work with engineers and consultants on different customer projects to develop an established communication plan and build continuity through well-defined processes. The reason for a Salesforce Project Manager to possess salesforce experience is that he or she needs to set the expectations and delivery timelines in accordance with the business requirements to meet the budget and schedule objectives. A professional s who exhibits proof of successful project implementations and possesses strong requirement gathering skills is more likely to be hired as a Salesforce project manager at an organization. 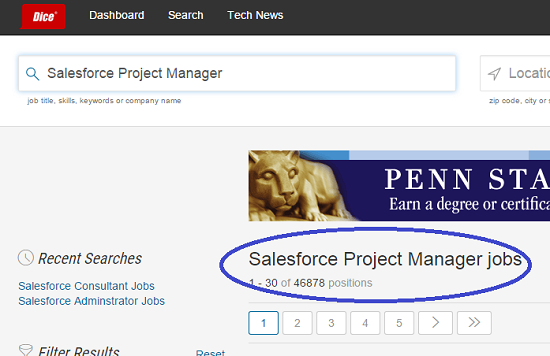 According to Indeed, the average salary for a Salesforce Project Manager in US is $94,000.As of 22 nd July, 2015, the search term for Salesforce Project Manager on the popular job portal Dice.com showed 46878 job listings. The salaries for Salesforce Project Managers range from $60,000 to $150,000. The job role of a Salesforce Business Analyst requires analysing business requirements and converting them into effective Salesforce solutions that will help boost the revenue generation. They also run, manage and analyse the salesforce implementations within an organization. According to Indeed, the average salary for a Salesforce Business Analyst in US is $84,000. 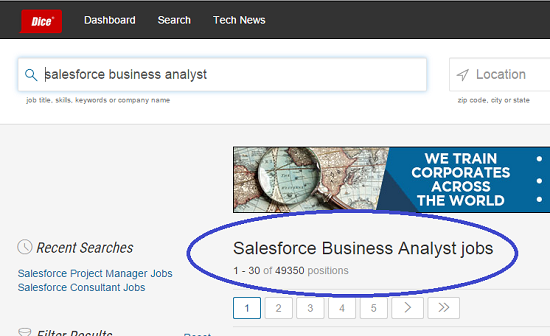 As of 22 nd July, 2015, the search term for Salesforce Business Analyst on the popular job portal Dice.com showed 49350 job listings. The salaries for Salesforce Business Analysts range from $70,000 to as high as $215,000 paid to professionals working at Salesforce.com. Employers look for a talented resource pool of candidates on the Salesforce community discussion boards. There are separate job boards for Salesforce Administrators and Salesforce Developers. So, if you are an individual looking for a Salesforce job opportunity, you can become a part of this community. Salesforce.com Professional LinkedIn Network is the oldest LinkedIn group managed by Salesforce.com employees. The group gives updated on the latest Salesforce job opportunities at Salesforce.com and various other IT organizations. For professionals interested to develop Salesforce skills, click here to take a formal training that will enhance your skills on the use of Salesforce platform. Grab the opportunities as they arise, if you hesitate now to master your skills on the Salesforce CRM platform then you will definitely miss the salesforce career boat later. The window of Salesforce opportunities is open now, go grab it! Disclaimer – The average salaries and job listings for each of the Salesforce job roles has been researched from Indeed and Dice job portals.